Wednesday is Reformation Day -a day mostly known and celebrated as Halloween. I'm not a big fan of Halloween and we do not celebrate that in our household. What we do celebrate is Reformation Day - the day in 1517 when Martin Luther (not King Jr.) nailed his 95 Thesis on the church door in Wittenburg, calling for a reformation of the Roman Catholic Church. If you are a protestant, this day is rather a big day in history (although the Reformation was not sparked solely by Luther, he certainly got everyone's attention with his actions!). You can learn more about the day HERE. Finding quality resources to teach our kids about this day has been somewhat difficult, mostly because the historical event is not widely known and remembered by the church at large. Last week I shared about the book, Courage and Conviction, which I think is awesome for ages 9 and up. However, my children are 6 and under so I'm always on the look out for other materials which we can use to explain who Martin Luther is and what role he played in changing the way the world looks and operates. 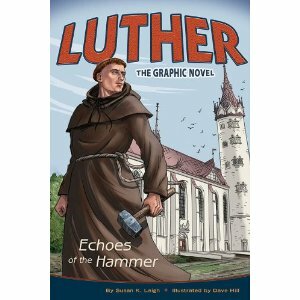 Luther: Echoes of the Hammer is a graphic novel so in order to like this you'll need to like graphic novels. Which I rather do not. I'm not presenting this one so much because I was a big fan, but because it's an option as a resource. The facts in the book are correct and the pictures and text walk you through Martin Luther's life, from his birth to his death. I do like the illustrations (no, I cannot explain why I am ok with the illustrations but not the "graphic novel" bit) and also that there are little boxes of text which explain what the Diet of Worms was so that the young reader is not confused. I also like the fact that some page spreads do not contain the "cartoon boxes" but are filled with text only and information which helps to explain the story. For example there is a page spread telling you more about the peasant's war to help you track with the timeline of events. Speaking of timelines, the back pages contain one, as well as additional reading suggestions and a picture of Martin Luther's seal which he designed for himself. One additional note: although I am not a huge fan of graphic novels myself, I will keep this on our personal bookshelves because I just do not know what is going to appeal to these children of mine in the future. That said, you will never find a graphic novel of Anne of Green Gables on my bookshelf. Accurate historical facts told in the proper order is one thing. Classic stories are something altogether different. I received a copy of the above title for review from Concordia Publishing House in exchange for my honest thoughts. 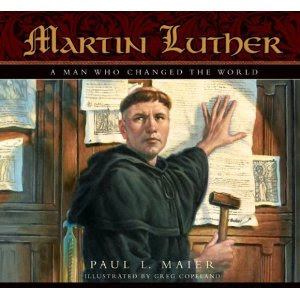 Paul L. Maier, author of Martin Luther: A Man Who Changed The World is a really big fan of Luther's. Now, first I should tell you that I really liked this book for my kids. The illustrations by Greg Copeland are beautiful and nicely done. Nothing about this picture book history is cheesy and it explains in elementary terms who Luther was and what he did in and for the church. Maier does parade Luther as "one of the greatest man who ever lived" and indicated that "even his enemies thought he was a genius." You definitely walk away from this book thinking well of Luther - but also feeling a bit of annoyance towards him for being so amazing. I think he might be a bit too perfect in this picture book, whereas in real life he made people extremely angry and his sarcastic wit got him into major trouble. It still does, even five hundred years later. On the whole though, I recommend this one as a beautifully illustrated, solid elementary-aged explanation of who Luther was. I'm glad to be in possession of this title. I purchased this book for us, but it is published by Concordia also. 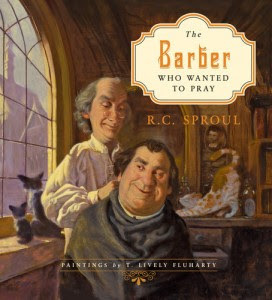 I offered a review of The Barber Who Wanted to Pray last year, so I'll not repeat my thoughts on that one. Martin! 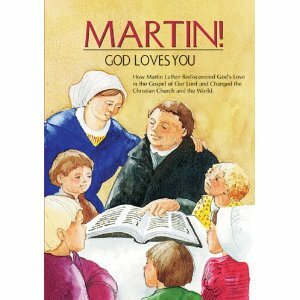 God Loves You is a 30 minute children's DVD which illustrates Luther's life from birth to death. This is kind of like a book which is being read with illustrations - Reading Rainbow style (if that helps you). It is not animated. The story is narrated in a decent manner, but it's not fantastic. The illustrations are ok, but not stupendous. (A few of them which show Martin Luther looking up to Heaven are almost freaky, I thought.) I was personally frustrated watching this with my kids because it's not remarkably well done and I'm so. tired. of finding Christian resources that are subpar. God gifted His people with such creativity and ability to create beauty and yet we're making pretty sloppy stuff and are hoping our children will be attracted to it?! My kids were bored during this film and I really couldn't blame them for being so. It's poor quality and while, yes, I understand the producers were trying to make something useful in a tasteful manner, I think they failed. I'm really ready to see some Christian artist apply themselves to honing their skills to make beautiful things. Beauty attracts children to truth. I'm not talking about beauty for beauty's sake - but beauty for truth's sake. The gospel is truth and it is beautiful in all it's accurate wonder. Anyway, this is really a rant for another day. For the moment, here is a video that is available to you, but I wasn't overly impressed (nor were my offspring) but it's the best I've found so far. I purchased this. But I sort of wish I hadn't. 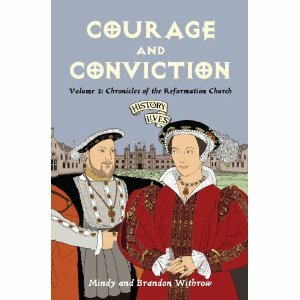 As mentioned, the other day I also reviewed Courage and Conviction which is part of the History Lives series. I highly recommend that resource to you. In the meantime, if you have a resource that you know of that you do not see here, please let me know of it in the comment section! I'll check it out! I too am rather tired of the poor quality of much that is marketed toward Christians. Are we really that unable to be discriminate in what we buy? I think this ties in to your other pet peeve, about the presentation of an historical character as a god-like hero. In the case of Luther, perhaps the author is afraid to present a picture of a flawed man used by God. (Luther's views on the Jews were pretty bad, for instance.) Do they really think that Christians are unable or unwilling to use their brains to make complex assessments? I'm so thankful for this post! Jordan asked me last night what my favorite part of Halloween is and I had to be honest and tell him that I don't like Halloween, I like fall. It sparked a conversation about WHY I don't like Halloween (darkness and evil and scary) and why he does (costumes and candy!). I'm hoping the library has a couple of these titles (on the shelves, not checked out!) so we can learn some more history about the day! OK, so my first suggestion, "Lady Jane Gray, Nine Day Queen of England," by Faith Cook, is not a children's resource, but I highly recommend it. A story of a political pawn with stalwart, Protestant faith. The first chapter or two are mostly setting the stage, context etc. I highly recommend reading at least appendix #1. For teens, I would suggest "Against the Tide," by Hope Irvin Marston. That is, if you include Scottish Covenanters as reformers. For children's books, I read some that were all by the same author, but I can't remember who it was... There was a book about Erasmus called "The Man That Laid the Egg" And one about Gutenburg called "Ink on His Fingers."